Ask Real Astrologers: How Can I Create My Own Transit Chart? Although I’m a fairly recent subscriber, I was drawn to a number of your interpretations. I do have a question for you. I can’t quite understand how to do “overlays” of recent events on my natal chart, such as Uranus in Aries or the more recent solar eclipse. Any quick way I can reach my own understanding of how I interpret various astrological events based on my natal chart would be appreciated. Perhaps this is a complicated question…? Dan, this is a great question, and I’m sure many readers would like to know how they, too, can do some of their own chart interpretation. It is a bit complicated, but it’s well worth making the effort, so I’ll walk you through the steps to create your own transit chart. First, I should explain to those not familiar with the term what a “transit” is. At the moment you were born, the planets were in a specific pattern in the heavens. This “freeze-frame” of planetary motion is your birth chart. As the planets continue to move over time, they form mathematical relationships to the planets in your birth chart. By overlaying the transiting planets onto your birth chart, we create a transit chart, which we can use to tell us how cosmic forces are playing out in your life. By far the best site on the Internet for getting your chart is Astrodienst. You’ll need to register and create an account, but it’s free. They also offer a limited amount of interpretation (with a paid subscription, you get a bit more), from some of the world’s best astrologers. To get a transit chart on Astrodienst, click on the “Free Horoscopes” tab at the top of the page, and then scroll down to “Extended Chart Selection” on the right. A page will come up with chart selection options. Under “Methods,” you get to choose a group. The default is “Circular Charts,” which is the style most people are familiar with. I prefer Pullen, because it’s easier to read. But for the purposes of this tutorial, we’ll stay with Circular Charts. Right under “Circular Charts,” you’ll see a drop-down menu. The default chart is “Natal Chart Wheel.” If you click on the arrow to the right, you’ll see lots of other options. Under the heading “Prognostic Methods,” you’ll see “transits.” Click on “Natal chart and transits*”. The asterisk on some of the options means that you have to select a date. To select a date, keep going down the Extended Chart Selection page to “Options.” You can enter any date you wish there. This is where it gets a bit complicated. All of the dates used on this site give the transits for midnight, Universal Time. The East Coast of the United States is five hours behind UT, so you have to take this into account. Usually, if you want transits for a certain date, entering the following day for the transit chart works. For example, to get your transits for the solar eclipse on July 11, you would type in July 12. Then click on “show chart.” You’ll see the transits on the outside of the wheel, in green. The process is similar for Pullen; there are just fewer options to choose from (less confusing!). On the Pullen chart, your natal planets are toward the inside of the wheel, and the transits are toward the outside. When I write my weekly forecasts, I often recommend that you check your natal chart to see which houses the aspects I’m writing about fall in. Many of you have written specifically to ask how the cardinal T-square will affect you. Well, now you can do a little of your own astrological analysis! I would like to issue one word of caution, though, about using the interpretations on Astrodienst. Although I rate them the best on the Internet, they take each aspect and transit by itself. What you end up with is a cookbook approach that doesn’t give you a whole picture and in some cases even gives you conflicting information. The only way to get an accurate big picture is by consulting a professional astrologer. If anyone is having this issue, please contact me for a personal reading. I offer half-hour consultations by phone, which should be plenty enough to help you clear up any confusion you might encounter when you use these online resources. You also could study astrology, as many of you already are doing. Of course, you have my wholehearted support there! Speaking of support, I’d like to thank you again, Dan, for sending a generous donation to RealAstrologers, especially since you only recently found the site. To everyone else who sent contributions, I also remain grateful. To those who haven’t donated yet, would you please consider taking a moment to click on the “Donate” button to the right? It will take you to a PayPal page where you can make a secure payment. With your contributions, I’ll be able to make some changes to the site that will make it even more interesting and useful. I’m working on a couple of ideas and hope to have news for you soon. Thanks for writing, Dan, and best wishes for a wonderful, abundant future. This entry was posted in Ask Real Astrologers, Birth chart and tagged birth chart, cardinal T-square, transits on July 30, 2010 by Pat. Ask Real Astrologers: When Can I Make a Move? I would like to go somewhere and find a job but don’t know where to start. I am thinking to come back to [the U.S.], if I sell my condo then I will have money to start. If you could see in my chart what is going on with selling that condo, that would be nice. We got an offer three months ago and since then we are waiting. Zana, when it comes to real estate questions, we look for transits to the fourth house, which rules home and family, and to the eighth house, which rules income from sources other than what you earn on the job. Real estate profits fall in this sector. Saturn, the planet of limitation, currently is moving through your fourth house, suggesting that you may be “stuck” at home, which may be hindering your attempts to find a job. However, with Uranus opposite Saturn in your tenth house of career, it’s possible that you may find a sudden opportunity soon. Uranus currently is retrograde, but he returns direct on December 1. That’s not so far away. At the same time, we are in a series of eclipses that is affecting your eighth house, along with your second house, which concerns earned income. There is a solar eclipse on Jan. 15, 2010, in your eighth house that could signal some real estate income, although that is not the only potential outcome of that eclipse. Since you are talking about relocating to a new country, we also can look to the ninth house, which is associated with long-distance travel. Neptune, Chiron, and Jupiter are stacked up in this area of chart. Of the three, Jupiter is the best indicator of expansion and good fortune. The Big Guy is retrograde right now, which lessens his beneficial influence, but you may get some leads on work or living arrangements after he returns direct on October 13. Your chances for everything lining up look best around the first of the year. But of course we’ll keep our fingers crossed that it happens sooner. Hang in there, and keep us posted! By the way, Zana gets major points for following our instructions for submitting questions. She gave us full birth data, her current location, and a specific question. Even after our column last week, we continue to get questions with no birth data. We’re astrologers, not psychics! Zana, my feeling is that Uranus transiting over your Moon, ruler of the fourth house, in the spring of next year will bring new direction and possible relocation. Uranus transits encourage us to do what is best for us as individuals, a good thing for those who tend to put the needs of others before their own, to their detriment. Another celestial event coming up in December is Mars in Leo going retrograde for a couple of months. Mars will be going back and forth over your natal Uranus, triggering a square to Venus, ruler of your Sun in Taurus. You may want to keep in mind that you will be feeling much less patient with things than you usually do. As the fourth Saturn-Uranus opposition grows closer in late March and April 2010, prepare to feel an increase in tension, because this one will exactly conjoin and oppose your Moon. Having several options as to what you want to do would be a good idea. Uranus is noted for last-minute changes due to unexpected events. I know fixed-sign Sun people like you with lots of earth in their charts prefer to take their own sweet time and don’t like to be rushed! That’s why having a plan with many flexible options is extra important. Good luck, Zana, and I wish you smooth transitions to your new home wherever that may be! This entry was posted in About astrology, Ask Real Astrologers and tagged birth chart, Saturn-Uranus opposition, transit reading on September 25, 2009 by Pat. Saturday Extra: Where Do We Start? Did you notice that the first day of spring is early this year? The dates of the equinoxes change from one year to the next, which means that the dates of the astrological Sun signs also change. If you’d like the scientific explanation of this phenomenon, there’s a great article on Live Science. The equinoxes and solstices are the cusps of the four cardinal signs — Aries, Cancer, Libra, and Capricorn. But the cusps of the other signs change, too, so if you were born around the dates when the signs change, you can’t rely on the dates given in newspaper horoscopes to get your correct Sun sign. Not that any our sophisticated readers would do such a thing, but I just thought I’d mention it, as this is a bit confusing. For those born around the dates that the Sun changes signs, including the equinoxes and solstices, the only way to be sure of your Sun sign is to have your chart done. Fortunately, there are some good online astrology sites that let you do this for free. By far the best is the Swiss Astrodienst, which I highly recommend. What if you were born on a day when the Sun changed signs? Hopefully, you know what time you were born. If not, you may want to get a chart rectification, a technique astrologers use to try to determine or fine-tune birth times. Then you will need to test it over time to see if it corresponds to current transits. 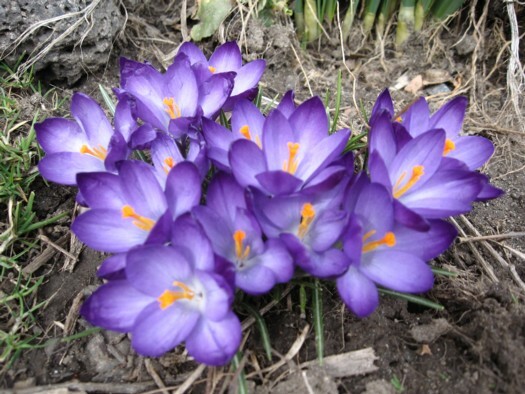 Image: Spring crocuses. Neith captured these little lovelies turning their faces up to the equinox sun yesterday. I found this bit of trivia on Wikipedia and thought it was appropriate: The financial community sometimes refers to companies or economic sectors that rise early after an economic downturn as “Crocuses” in reference to the flower’s ability to thrive in the late winter or early spring. This entry was posted in About astrology, Birth chart, Saturday Extra! and tagged birth chart, cusps, equinox on March 21, 2009 by Pat. Ask Real Astrologers: I’m New to This, What’s It All Mean? I had my birth chart done and am totally new at this. I was reading that Uranus is opposed to Saturn until 2010. What does it mean, that serious decisions I have coming up could/will affect me for years? My Moon is in Pisces. I knew long before that something was going to happen in 2012. I specifically married on the Winter Solstice, 2003, to a man I believe I knew from my Egyptian past life. His Moon is in Aquarius. Well, Susan, that’s a load! We don’t have enough space here for me to answer all your questions thoroughly, but I’ll try to give you a brief big picture. First of all, “getting your chart done” for a lot of people means having an astrologer interpret their birth chart. I don’t find this particularly useful. In my readings, I do transit charts — in other words, I look at where the planets are today in relation to their positions in your birth chart, and that way I can determine what forces are most influencing your life. Your first question, about how the Saturn-Uranus opposition will affect you, is a transit question. In September 2009, Saturn and Uranus will form an exact opposition at 25 degrees Virgo and Pisces, which forms a conflicting square to your Ascendant at 25 degrees Sagittarius and your Descendant at 25 degrees Gemini. I believe you will see some big changes in your life at this time, and they could extend to your marriage, although this is not necessarily a bad thing. Neith has some things to add to this in her response, so I won’t go into more detail here. As for what might happen in 2012, I don’t see anything unusual in your chart. Pluto will be well into your first house, suggesting a slow transformation over time. But that has started already, so this is not news. By then, Neptune will be out of Aquarius (but not yet conjunct your Pisces Moon), and the current emphasis on Aquarius will be long gone, as will the effects of the mutual reception between Uranus, ruler of Aquarius, and Neptune, ruler of Pisces. I’m betting that you two are feeling this, probably by being in unusual psychic link. If you want to know more, I strongly recommend a transit reading, and you might also want to consider having a compatibility reading for you and your husband. Not only will this tell you more about your relationship’s strengths, weaknesses, and karmic connections, but a skilled astrologer will be able to identify time periods when significant connections between you may be activated. By the way, I share your Moon in Pisces and can tell you that this is a quite psychic placement of the Moon that puts you in touch with “higher” forces. The only difficulty is that your imagination can get the better of you, but with some training and discipline, this can be a powerful tool to give you an edge in life. Thanks for writing, Susan, and best wishes for the coming year. Yes, Susan, the Saturn-Uranus opposition definitely will impact your chart next year! The next exact pass on February 5, 2009, will find Saturn exactly conjunct your natal Jupiter in Virgo, likely causing you to slow down and make any necessary changes one step at a time. Since Jupiter rules your Sagittarius Ascendant and is located in the ninth house where Sagittarius rules, this is a significant transit all right. The other factor with this transit is that, while Saturn is conjoining your Jupiter, it will be moving closer to an exact square with your Ascendant. By the next exact Saturn-Uranus opposition on September 15, 2009, the square to your Ascendant will be much tighter and therefore have more impact. I suggest you prepare to feel frustrated more often than not and to feel like your style will be severely cramped over the coming months. However, in the end if you step up and do what needs doing as gracefully as possible, you will be much further ahead. Saturn can be very helpful in bringing discipline and determination to aid you on your path, but with Uranus opposing your Jupiter at the same time making you very restless, this is going to be a challenging period for you. What Uranus will bring to the table is many new insights and unconventional ideas and solutions. You may be presented with an opportunity to study in a unique environment. If so, go for it! Good fortune on your journey, Susan. This entry was posted in About astrology, Ask Real Astrologers, Birth chart and tagged birth chart, compatibility, Saturn-Uranus opposition, transit reading on December 26, 2008 by Pat. Ask Real Astrologers: What Is the Significance of a Cardinal Cross? Hello and thank you for your kind work. I have been told that I have a cardinal cross in my chart, and am wondering what that means, if it is so. I appreciate your time and consideration of this question. Anya, a cardinal cross in your chart means you have four planets, one in each cardinal sign (Aries, Cancer, Libra, and Capricorn) aspecting each other. A grand cross has four 90° angles and two oppositions and it is a powerful but stable pattern. Because it is in the cardinal mode, you most likely are very good at initiating action and may be a natural leader. However, unless you have other planets and angles in either fixed or mutable signs for balance, finishing what you start may be a problem. A grand cross also means you have four planets evenly spaced around your chart wheel, and whenever transiting planets are in the cardinal signs you will have one corner of the cross being conjoined, squared or opposed. The Sun will conjoin each planet in the grand cross four times during the year, and this can be a great learning tool for you, since the Sun’s transits are brief. If you wish to learn more about your chart, you can get a free chart at Astrodienst. You can also get some interpretations, but they are computer-generated and no substitute for a reading from a real astrologer. Either Pat or I can give you more feedback, if you wish to order a report. Astrology is a wonderful tool to learn more about who we are and why we do what we do. Anya, this is a great question. Since you didn’t supply any birth data, we will assume that you indeed have a cardinal grand cross in your chart, but let me just comment that, to be technically a grand cross, the planets forming the cross must be among the eight planets (yes, Pluto counts!) plus Sun and Moon. Chiron and the asteroids don’t count, nor does the Ascendant or Midheaven. In my chart, for example, three planets are in the early degrees of Taurus, Leo, and Scorpio, with my Aquarius Ascendant directly opposite. But this is still just a T-square, not a grand cross. So with that caveat, the classic interpretation of a cardinal grand cross in the natal chart is just as Neith describes. Of the three types of grand crosses — cardinal, fixed, and mutable — this is the easiest to have in your chart. You may be very dynamic and active, but it’s easy to just spin your wheels and not get anywhere unless you have an outlet for all this wonderful energy. To discover where your best outlets are and how to take advantage of them, look for sextiles or trines to the planets forming the grand cross. Wishing you much love and luck, Anya, and thanks for taking the time to write. This entry was posted in About astrology, Ask Real Astrologers, Birth chart and tagged birth chart, cardinal cross on August 22, 2008 by Pat.